Aung San Suu Kyi, Myanmar state counselor, left, speaks with Canadian Prime Minister Justin Trudeau in Ottawa last year. "In 2007, the House of Commons granted Aung San Suu Kyi the status of honorary Canadian citizen. Today, the House unanimously passed a motion to remove this status," Foreign Ministry spokesman Adam Austen said. Suu Kyi, who spent 15 years under house arrest as she fought for democracy against the country's military junta, won the Nobel Peace Prize in 1991 for her efforts. However, since becoming Myanmar's state counselor in 2016, her international reputation has taken a severe beating. Although Suu Kyi's leadership post does not give her control over Myanmar's powerful military, her failure to stop what the United Nations has labeled a "textbook example of ethnic cleansing" by army soldiers against minority Rohingya Muslims in the country's western Rakhine state has drawn nearly universal opprobrium. Thousands of Rohingya have been killed and nearly 700,000 have been forced to flee to neighboring Bangladesh since soldiers and pro-government militia first launched retaliatory strikes on civilians in 2016 in response to Rohingya militants who attacked government police stations and army posts. 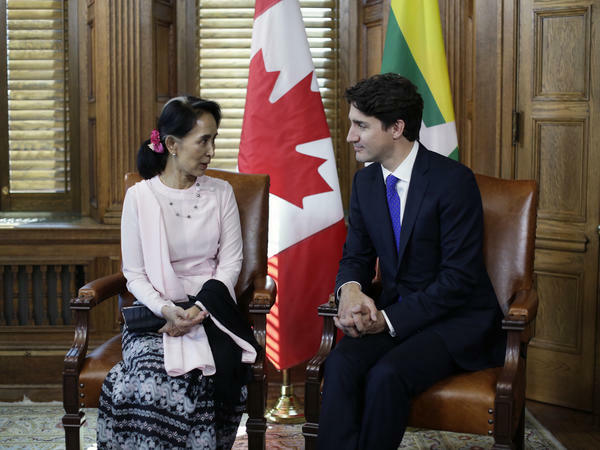 Austen, the Foreign Ministry spokesman said Canada "will continue to support the Rohingyas by providing humanitarian assistance, imposing sanctions against Myanmar's generals and demanding that those responsible be held accountable before a competent international body." However, as Reuters notes, "The move by the House of Commons lower chamber has no immediate effect because honorary citizenship is conferred by a joint resolution of both the House and the upper Senate chamber and officials say it must be removed the same way." "I think it's a great symbol," Bloc Québécois MP Gabriel Ste-Marie, who presented the motion, said following the vote. Ste-Marie said the move presents a "good image at the international level to say, 'No, if you are [an] accomplice of a genocide you won't have the honorary citizenship here," according to The Toronto Star.